Luxgen 7 mid-sized sport utility vehicles ready to roll off the production line. HANGZHOU - The first product from Dongfeng Yulon Motor Co, the new Chinese mainland-Taiwan joint venture, rolled off the production line on July 28. 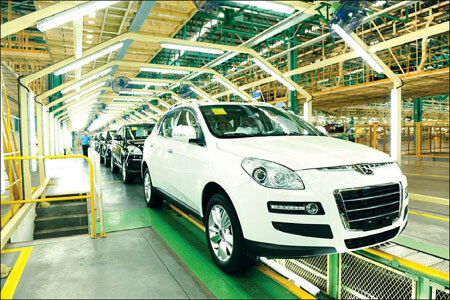 Its Luxgen 7 mid-sized sport utility vehicle is now offered for presale at prices ranging from 190,000 to 270,000 yuan. The model will formally hit the market in two months, the company said. Hubei-based Dongfeng Motor Corp and Taiwan's largest carmaker Yulon Motor Co formed the partnership in Hangzhou, Zhejiang province at the end of last year with each holding a 50 percent stake. The joint venture says the first model from the new mainland brand has a rich array of intelligent equipment usually found only on premium cars including 360-degree surround imaging, a night view assist system, a side view assist system and lane support warning system. Paired with a five-speed automatic transmission, the Luxgen's 2.2-liter turbocharged engine can produce peak power of 131 kW and top torque of 275 Nm. The model will mainly compete with SUVs made at Sino-foreign joint ventures, including the Highlander by Guangqi Toyota and the upcoming Dongfeng Nissan Murano, said market observers. But because of a weaker brand image than its Japanese, German and US counterparts, market prospects for the brand remain uncertain, they added. Although Yulon's Luxgen models sell well in Taiwan, the mainland market - with more than 30 SUV models now on offer - has much fiercer competition, said Zhu Ming, a senior automotive analyst of JD Power. As well, mainland SUV buyers have keen awareness of brand image, so a new and unproven brand like Luxgen may not meet their requirements at the very beginning, Zhu said. But the market's potential is huge and appealing, analysts said. China's overall passenger vehicle market grew 5.75 percent to 7.1 million units in the first half this year, according to statistics from China Association of Automobile Manufacturers. The SUV segment registered an even faster pace, increasing 21 percent to more than 710,000 units in the first six months this year, the association said. Dongfeng Yulon says it plans to launch one or two new models every year over the next five years, including multi-purpose vehicles, sedans and electric cars. Zhou Wenjie, chairman of the joint venture, said the company's mid-term target is to sell of 200,000 vehicles annually and generate revenue of 25 billion yuan in 2015. The Luxgen 7 will be distributed at the joint venture's newly established dealer network across the country, which will have about 80 showrooms by the end of this year. The company claimed that it will bring a whole new approach to selling cars in China featuring a high-tech and interactive customer experience different from an ordinary outlet. A special zone in every showroom will have video screens ringing the car that will enable customers to try various functions as the screen simulates a real driving environment. The first Dongfeng Yulon showroom will open in Hangzhou later this month, the company said. Jia Xinguang, an independent automotive analyst, said that Taiwanese companies traditionally provide good services, which could be an advantage for Luxgen's development in the mainland market. He noted that the most important task for Luxgen is to build its brand strength, but "it needs some time". Kuo-Rong Chen, vice-chairman of Dongfeng Yulon, said that Luxgen in Taiwan has caught up with Japanese automakers Toyota and Honda in brand recognition. The price of a Luxgen on the used car market in Taiwan even exceeds Honda models in the same segment, he said, noting that it is a result of the company's clear and consistent pricing strategy. Luxgen in Taiwan has a unified price that helps defend its brand value, Chen said, adding that the joint venture will apply the same strategy on the mainland.